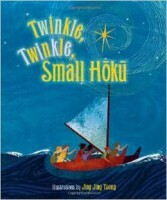 This Hawaiiana version of the classic rhyme takes children on a poetic journey across the ocean with canoe paddlers. When the waves are high, when the storm clouds roll in, the star (hoku) shines and never fails to provide hope, guidance, and comfort. A perfect bedtime story sure to lull your little ones to sleep so they may dream of adventures secure in knowing that the guiding star in their lives will always be there to keep them safe and sound.